Keith Thurman, the current unified WBA and WBC Welterweight World Champion, was a guest of the Philadelphia Phillies prior to their Tampa Bay Rays game in Clearwater, FL yesterday. Thurman spoke to the team prior to the game about his philosophy in boxing, and shared his personal success story of learning how to box in the Clearwater Parks and Recreation program to now being the unified welterweight champion. The Phillies beat the Rays, 6-3. Thurman was invited to speak to the team by Phillies Manager Gabe Kapler, who heard Thurman speak at the Clearwater for Youth awards banquet where Keith received the “Champion for Youth” award. It was after that speech that the two discussed Thurman coming to talk to the team before a game, and sharing his story and mission for his athletic career. Thurman also threw out the first pitch along with Philadelphia Eagles quarterback Nick Foles. 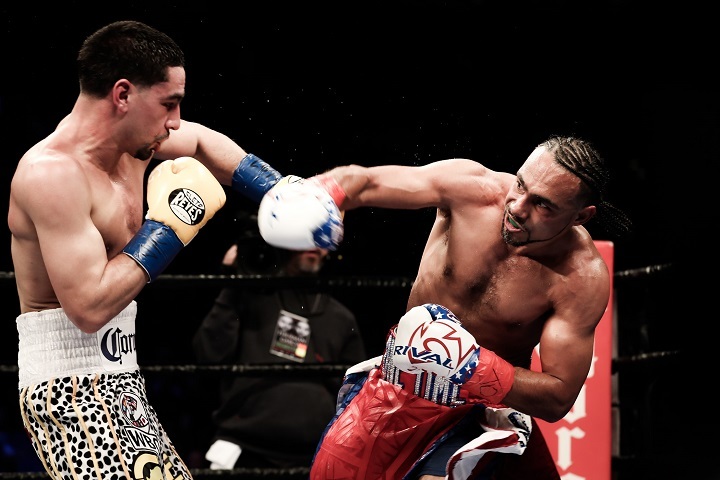 Thurman trains out of St. Petersburg, FL with trainer Dan Birmingham, Chris Getty and Eric Wilson and is due back in the ring May 19 at Barclays Center in Brooklyn, NY.